The breakout star of the show? My KitchenAid mixer. I had seen somewhere online that it is possible to shred meat with a mixer, and I can verify that claim! I started by putting a bunch of chicken into a covered roasting pan and baking it at 350° for an hour. 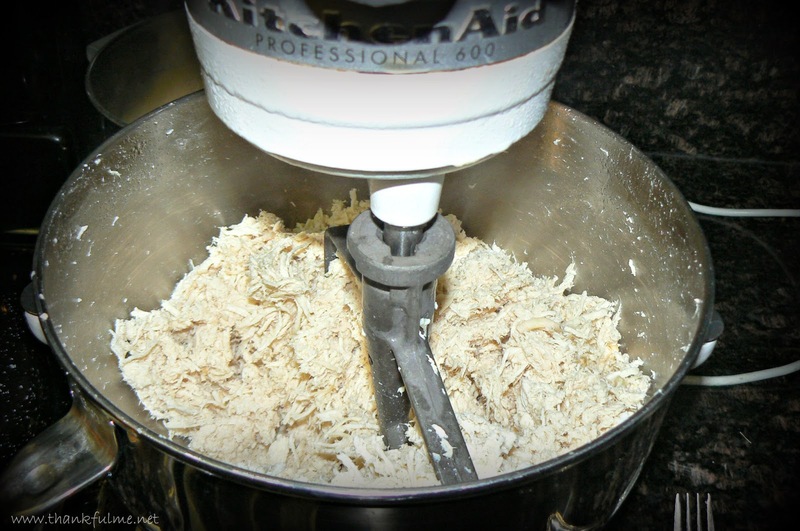 Then I put some of the cooked breasts into my mixer, and turned it on a low speed. Voila! Perfectly shredded chicken, ready for recipes. I made burritos, pot pies, a whole bunch of different freezer-to-crockpot meals, and more. It was an intense day or two, but now I can relax knowing that dinner is already made! Thankful Thought: I'm thankful for freezer meals--and the tools to prepare them! Clever idea. I like having grab and go meals handy, too. You have just changed my world FOREVER!!!! The biggest pain about using chicken is the shredding! What a great idea! I have a KitchenAid, too. Richard got it for me at least 20 years ago. It is boring white and I will never get a cute pink or red one as it is never going to quit -- and that is OK! I do love it but had never thought to use it to shred chicken! Thanks again for the great tip. I get a couple big trays of boneless, skinless chicken breasts from Sam's Club and cut the ooky stuff off and then cut them all into bite sized pieces and bake it all with a can of cream of chicken soup thrown in. Then I divide it all into 2 cup portions in freezer bags. Recipe ready.